The presence of recently-crowned Formula One World Champion, Nico Rosberg, was a key highlight of the Club’s Annual Awards, hosted and compered by Jake Humphrey at the Grand Connaught Rooms in London’s Covent Garden. Nico received the Johnny Wakefield Trophy for the fastest lap of the year on Silverstone's Grand Prix circuit and was also presented with Honorary membership of the Club by BRDC President, Derek Warwick. Mercedes AMG Petronas Formula One Team’s Executive Director, Paddy Lowe, collected the Sir Jackie Stewart Award for his engineering brilliance that led to a third consecutive Formula One Constructors Championship. Formula One drivers Lewis Hamilton MBE and Daniel Ricciardo sent messages of appreciation for their Awards whilst BTCC star Colin Turkington was there to receive the second BRDC Silver Star of his career as the Member achieving the most points in the major national championships. Star of the future, Lando Norris had been announced the 2016 winner of the McLaren Autosport BRDC Young Driver of the Year competition at the previous evening’s Autosport Awards and he added to his trophy collection with the Chris Bristow Trophy and the Henry Surtees Award. The BRDC were also delighted to welcome Porsche’s World Endurance Champions Romain Dumas, Neel Jani and Marc Lieb as its guests to receive the coveted Silverstone-Le Mans Challenge Trophy, as well as reflect on a superb year in a category of motor racing very close to the heart of the BRDC and the Members who join the Club’s list of award winners thanks to their achievements in sports car and GT endurance racing in 2016. The event concluded with the presentation of an Honorary BRDC membership to motorcycle road racing legend John McGuinness, a very special accolade as the only other Member recognised for their outright achievements on a motorcycle is Valentino Rossi. 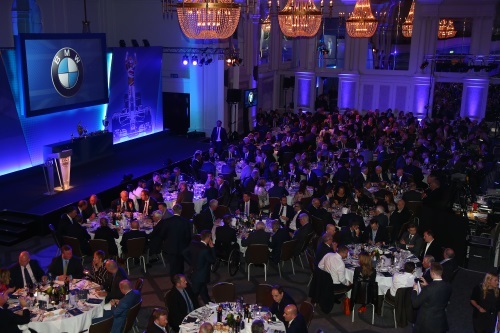 Fellow BRDC Members Ed Jones, Alexander Albon, George Russell and Jann Mardenborough were also honoured with BRDC awards having, achieved notable success this year in single seater championships worldwide. Sir Stirling Moss OBE and Lady Moss, Damon Hill OBE, Nigel Mansell CBE, Sir Chris Hoy MBE and 2017 Renault Sport Formula One Team driver Jolyon Palmer joined over 300 guests to celebrate at this exclusive event which also supported the BRDC Benevolent Fund. Thanks to the generosity of the Members and guests in attendance, £5,000 was raised which will go towards providing assistance to people in the motor sport industry during times of need.